Our Scotland is about to near its end, but we still have a couple of days left in Cairngorms National Park. During these days we stayed at Cairngorm Lodge Youth Hostel which is a typical hostel in the middle of the national park. The rooms were simple, the wifi weak, but the surroundings were plain beautiful - and we got a typical Scottish breakfast once more! The lovely dog from one of the other guests who was more than willing to say hi and get some head scratches. Allegedly, according to Jonathan, there was also a guest with a cat. We can't provide photo proof of that, though. 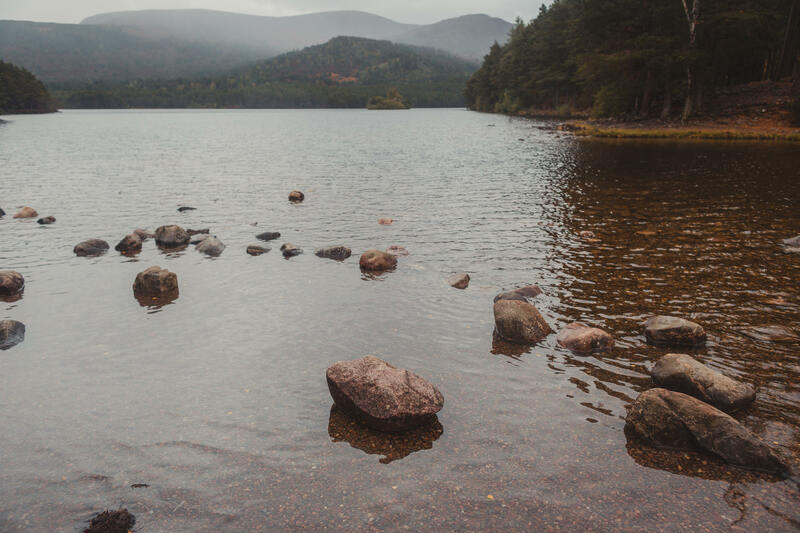 The first day in Cairngorms National Park we spent by driving around and picking a random lake for a long, nice walk. The weather was constantly changing that day and we made 11km with intervals of sunshine and rain showers. Comparison photos for lake photography without (left) and with a polaroid filter (right). The color of the fern really was that strong in reality, we didn't exaggerate (too much) with the editing here. Luckily we had brought some props, well, one, a black hood, that we could slip into. We also tried to catch and capture some sheep nearby a small chapel and cemetery once, but they certainly weren't willing to put up with that. So we only caught some photos from outside of the fence before they got suspicious of us and ran off. Our trusty car, a Nissan Qashqai from Celtic Legend. It's not the smallest car for some of the narrow streets, but we always felt safe and the automatic driving really was helpful. Well, or at least most of the time we were really happy with the car. Already back in Moray, it suddenly announced low tire pressure on one wheel. After researching the car manual and figuring out Scottish air machines, we did manage to fix the problem. Or so we thought. 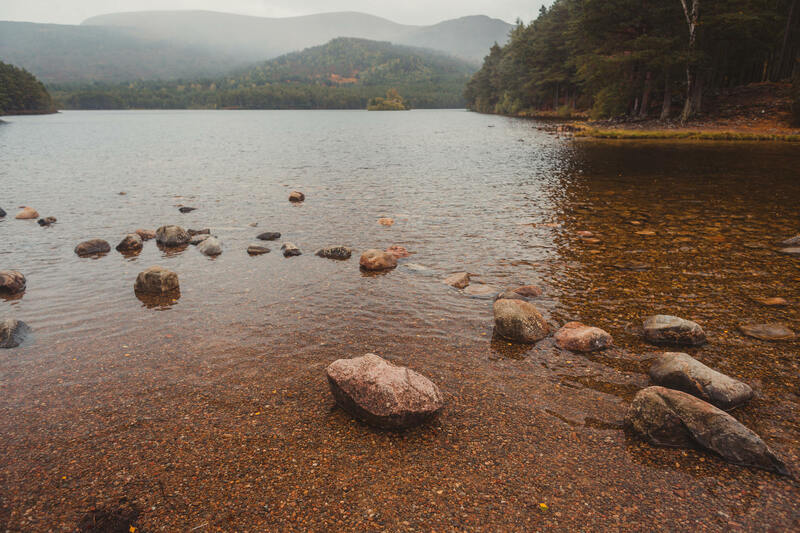 Luckily, Aviemore might seem like a village and tourist resort in the middle of nowhere, but it still is equipped with almost everything. Besides 3-4 outdoor shops, there was also a garage willing to repair the tire during the day. As it was windy and raining that day, we spent the waiting time checking out all the cafés and some of the outdoor shops in Aviemore. Another Scottish dish: Yorkshire Pudding to the right (no, it's not pudding), mashed potatoes and peas to the left and something called skirlie in the bottom. Skirlie basically is fried oatmeal. Thanks to the service of Celtic Legend which made it possible for us to get easy and fast help. As we aren't car owners, this certainly was a special experience in a foreign country with a foreign car. This is the last shot from Scotland on the SD card. Good bye - it truly has been a blast!